I have a wonderful chopper that I use to dice onions. I got it on Amazon.com, and it is one of the most helpful tools if you're making a lot of plant-based food. So, I take a bag of organic onions, cut them in half, remove the outer layer, cut them into quarters, and use the dicing tool to chop them. It takes about 3 minutes for an entire bag of onions! I put all of the onions into a big bowl. When I am done chopping, I scoop out 1 cup measures and put them into sandwich-sized plastic baggies (which can be reused!). I push the air out of the bag, zipper them, and put all of the baggies into one gallon-sized freezer bag. I store them in the freezer for future use. 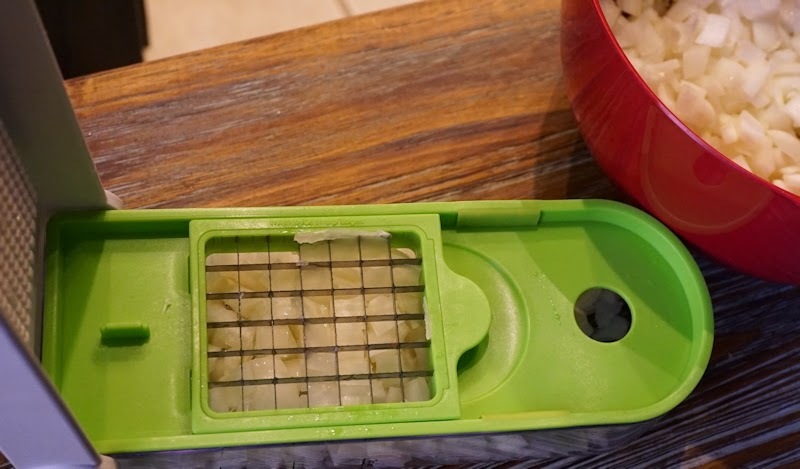 Being that the onions are frozen, they STEAMFRY wonderfully without any oil on medium-high heat. I use them in soups, stirfries, etc. Wonderful idea! I have had mine for a long time also but never thought to chop and freeze. Now I have to go do it. BTW, I went to Aldi yesterday and found the Vegan cookbook that you showed in your Aldi shopping video. I was disappointed that they didn't have the BBQ sauce that you found in your store, though. Going to a different town tomorrow so I will look in their Aldi store to see if I can find it. Thanks for all of your wonderfully good information. You are a treasure!